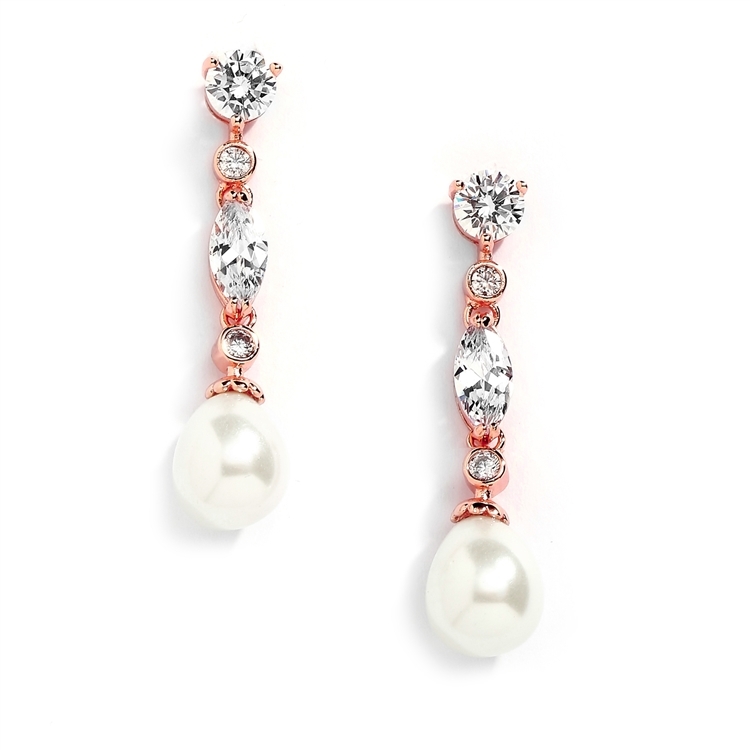 Make an unforgettable wedding day statement in these Gold Cubic Zirconia dangles earrings feature sparkling CZ gems and bold Soft Ivory pearl teardrops and genuine 14 Karat Rose Gold plating. With contemporary style and a touch of vintage-inspiration, these dramatic earrings will perfectly coordinate with any style wedding gown or evening attire - adding a serious dose of bling. These linear pearl drop earrings also make a gorgeous choice for bridesmaids and mothers of the bride. We can't resist the stunning mix of shapes and textures in these artful dangles. The earrings are 1 3/4" h including bold pearl teardrops measuring 10mm x 12mm. AAAAA Grade Cubic Zirconia and Genuine 14K Blush Gold Plating. We promise your customers will love these top selling beauties or your money-back.